Current version: 2.1.1 – no longer developed. DataGrab is a Windows data backup utility designed originally for PC technician usage. DataGrab was developed for quick one-click operation (yet with an array of options) to backup a Windows partition efficiently by retrieving all desired user data without temp/junk files and folders. DataGrab can operate on both a running Windows partition such as C: or an ‘offline’ / ‘slaved’ / WinPE booted E:/X:/W:hatever drive. DataGrab extends the convenience to PC technicians by backing up the same files and settings automatically that one would manually, while preserving an identical directory structure for an easy single command manual restoration process. This is also a good learning tool for those not familiar with the file system locations of various application data. Additionally, commonly used file types like various user documents and other items that may not be restored via simple copy operations (some email databases for example) can automatically be separated into another folder structure for easy manipulation while restoring data. Please remember that DataGrab is an unsupported and undeveloped project that we pulled up from the basement. NOTE: DataGrab stand-alone is not as comprehensive of a solution as the DataGrab section of d7, which is updated more frequently, however the d7 version is geared more towards PC technician usage. May 31st, 2011: DataGrab v1.2.3 featured on Featured on AddictiveTips.com! June 9th, 2011: DataGrab v1.2.3 featured on Lifehacker.com! June 11th, 2011: DataGrab v1.2.3 featured on MakeTechEasier.com! Purpose: To save you time! On the target partition, DataGrab backs up only the data you WANT from each user’s profile (and not all of it, e.g. temp files, etc.) such as documents, pictures, video, desktop, favorites, saved games, downloads, cookies, history, application data for Outlook (including PSTs and NK2) / Outlook Express DBXes and Windows Address Book, Firefox profiles, and stray Microsoft Office documents and PDFs, etc. etc. DataGrab has TWO copy modes. The recommended mode requires Roadkil.net’s Unstoppable Copier. When the Unstoppable Copier EXE is found DataGrab defaults to this mode, and instead of copying the files itself it uses Roadkil’s excellent utility by creating a batch configuration file for USC to use, then automatically launching it once the batch is created. To use Unstoppable Copier mode, you must name the EXE as unstopcpy.exe and place in the same directory as DataGrab.exe. Unstoppable Copier version 4 and above is required. Support for 3.x has expired. The default mode when USC is not found is to use Windows’ Shell API to copy files, (same method that Windows uses if you were to drag n’ drop/cut n’ paste within Explorer.) This is not the recommended mode as permissions issues, corrupted files, and other issues you may run into could halt the copy process. Fire it up, configure it how you want it. Don’t hit the copy button! Next click File > Save Config to Batch and give it a name. You will be prompted if you wish to run the batch silently (no indication the app is even running except via taskmgr) or not, which will display balloon tip popups from the system tray indicating the backup status. Drag and drop the batch file it created (*.DGB) on the DataGrab EXE to start the backup. Run DataGrab.exe with the full path/filename as a parameter. With this you can schedule your backups via Windows Task Scheduler or automate via batch/scripts. v2.1 – Re-introduced the ability to backup OS information (IP settings, mapped drives, shared folders, etc. ), Windows/Office Product keys, a list of installed applications, and the new ability to backup the ODBC reg keys. v2.0.3 – Removed the dependency on the Microsoft Common Dialog Control. v2.0.2 – Changed DataGrab w/Unstoppable Copier settings to only backup newer files (if those files already exist in the backup location and remain unchanged, they will be skipped to shorten the backup time. v2.0 – Partial re-write of the app. Simplified backup options for end users. Added a “batch” creation option to allow pre-configured settings for automated usage. 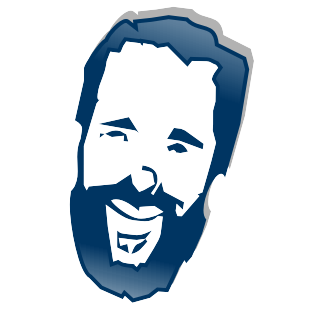 v1.2.3 – Final v1.x release. Target Partition – Select the partition you wish to backup. This can be your current OS partition, or the OS partition of an attached/slaved HDD. User Profile Location – Allows for manual selection of the user profile location on the target partition. Under this option you may select the specific user profiles you wish to backup, by ticking the check boxes beside the user name. All check boxes for users will be ticked automatically, unless D7/DataGrab detects that it does not have the appropriate permissions to access that directory or backup it’s data. Note running D7/DataGrab with system access may prevent it from properly accessing networking resources, such as a networked backup location. Search Entire Partition – This feature obviously searches the entire partition for the specified file types, and an entire partition search will add significant time to the backup process. The feature is very useful for that client who has stored their documents in WHO KNOWS WHAT LOCATION but not the standard My Documents! 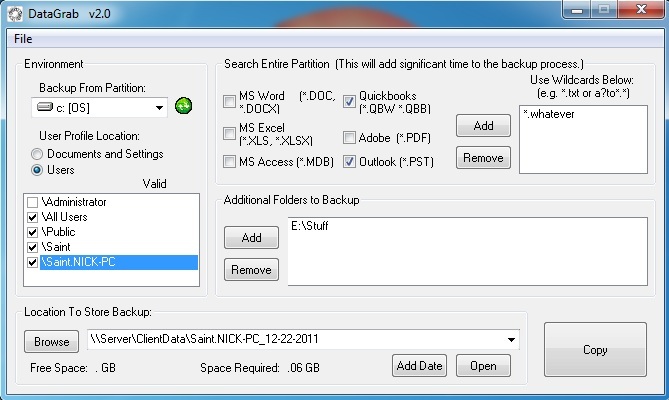 Utilizing this function will backup DUPLICATES of items that already exist in a location that is automatically backed up; for example if you have MS Word documents in a user profile you have ticked for backup, and you also select to search the entire partition for MS Word files, you will end up with two copies of the MS Word files in the backup. This function will put all MS Word files in the backup location under a root folder called “Word Files” (or similar, honestly I forget atm!) and the same idea goes for the other file types. You may manually add other filespec searches to this function using standard * and ? wildcards. For example you may add *.DAT manually, and in the backup you’ll have a DAT Files folder created to store all of the found DAT files. The Quickbooks files option will automatically be checked if the Quickbooks software was detected on the target partition. Additional Folders to Backup – This one should go without saying. Sometimes I see customers have created data backups or other special folders in the root of the partition, or perhaps a special legacy app has done this, so this feature comes in handy in this event. Also worthy of note, a Scans or Images directory found in the root of the target partition will be added automatically to this list; I do this because a lot of my business clients have been setup with a directory there for their networked scanner to dump images to. Backup Location – Also obvious, this is where you want your data to go. Select a predefined location from the drop down list or type in your own. Use the Add Date button to automatically date the backup folder. Add a user profile name to the backup location by right clicking the user profile name in the user list above, and clicking Add Highlighted Name to Backup Location. This is useful when the client has actually named their Windows user profile with their real name. I notice this does happen enough to make it a useful feature. For my usage, I typically have a backup location of NASClientDataClient Name _ Current Date so I know instantly when browsing who the backup is for and when it was created. Copy button – This of course starts the backup! So, WHAT exactly is backed up in the user profiles?! The idea behind DataGrab is to backup only what you WANT (user data), and none of the crap you DON’T (temp files/application data, for example) from the various user profiles you have ticked. This list may not be comprehensive, but I’ll try to get it all. Every stray MS Office / PDF document in the user profile directory itself (not in My Documents, for some reason. The Shared or Incomplete directories in the user profiles that some file sharing clients create. Outlook, Outlook Express, old Earthlink mail client, and Windows Mail / Windows Live Mail mail stores. Outlook/OE signatures, the NK2 file, and templates directories. Intuit/Quickbooks app data directories in case templates or some other important data exists. Every stray MS Office / PDF document in the root of the drive.